Since I became a stay-at-home mom I've come to realize that I'm a mess! 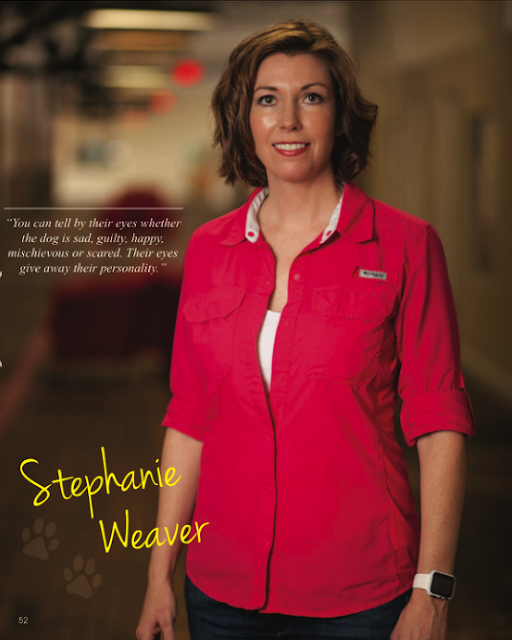 My work-life was completely organized, structured with spreadsheets, plans, goals etc. I knew where everything was. At home I've found I need to get this crap organized! So the first place I started was my pantry because I do have financial goals - you know, a budget - after all we did go from two incomes to one income. So in order to cut my grocery bill from $800 to $300 a month, I first needed to know what exactly I have available in my pantry. I WAS SHOCKED: I found 2 jars of opened Nutella, 2 others new, 3 jars of new peanut butter and 2 jars already open - how much peanut butter do I think we need?! I had a whole bunch of tin muffin cups falling all over the place. SERIOUSLY, how did I ignore this?! "Organize your pantry, go grocery shopping in your pantry BEFORE you go to the grocery store and make a list of what you need. 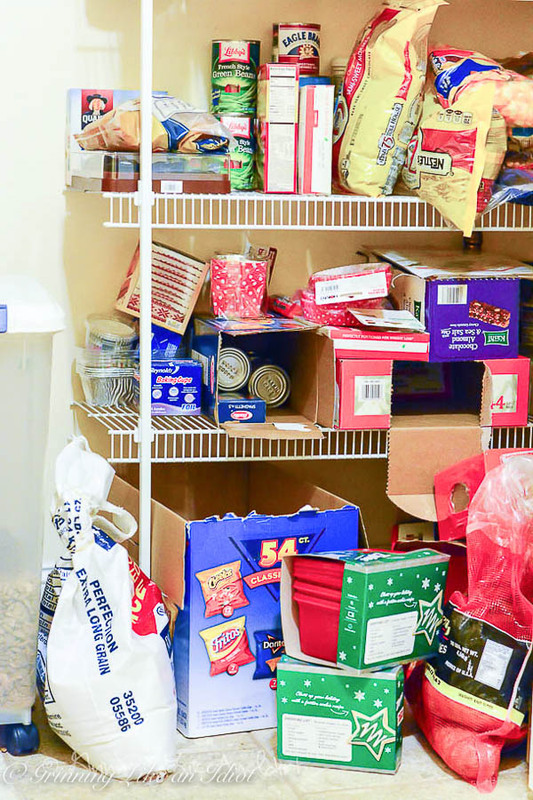 If you don't have space in your pantry for something, then you don't need it. Stay within $300 grocery budget and $150 household budget." Boxes, bags, and multiples of everything and no discernible organization method! I can't believe I lived like this! To get organized, I purchased 2 Interdesign 4-Piece Fridge and Freezer Storage Bins and 2 boxes of these cute Mikasa Set of 2 Stacking Storage Baskets Steel Wire 13.5x10.5x7.9 Organizer ! All within my 'Household' budget line item. The result, is huge! I had a ton of food that could easily last us for a month! 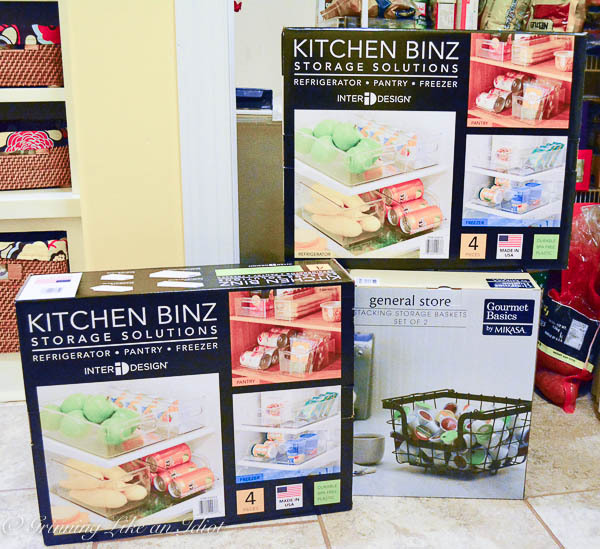 Compartmentalize: designate a shelf for a purpose and use the Kitchen Binz to further compartmentalize. For example: one shelf I have designated for side dishes: vegetables, rice and pasta. On that shelf within a Binz I have powder soups and rice packages, the vegetables are stacked within a Benz can holder. At a glance, I can tell what we have readily available for dinner, sack lunches, snacks etc. I did the same for a baking shelf. It is so handy to simply pull out a Binz and take it to the kitchen to make brownies! Make snacks visible - ditch the boxes. Put the snacks in clear containers instead of leaving them in a huge box. I used the stackable metal baskets for snacks. This way I know at a glance what remains and whether I actually need to purchase more AND the kids know what they can grab and how many is left. Donate staples that you know you won't eat. I've stubbornly held onto a box of granola bars I bought at Costco for about a year because 1)the kids said they'd eat them and darn it they are going to and 2) it was like 40 bars! The reality - even I didn't like the granola bars. It was time to consider it a sunk cost and give it to someone who might actually like them. Use wall space. 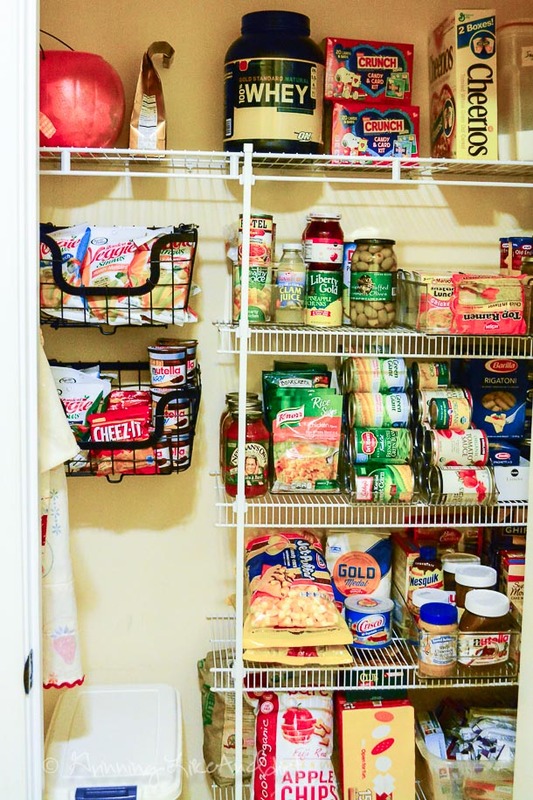 I used baskets were not actually meant to hang on the walls, but they were sturdy metal, so I installed brackets and screwed them on giving extra visible snack bins. 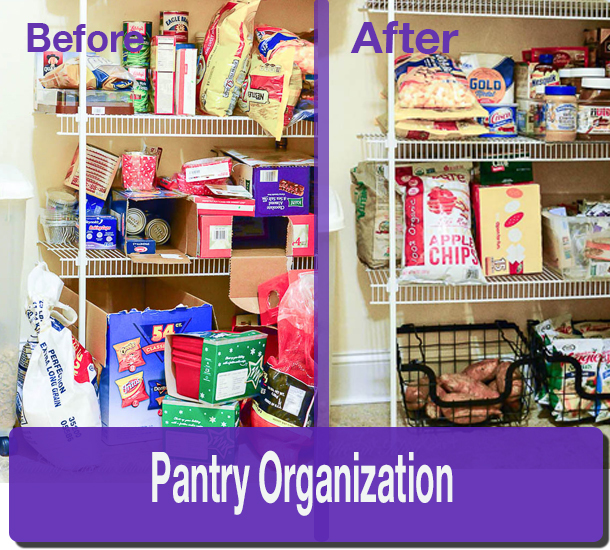 I've seen lots of organization posts that show baskets with labels or shelves with labels - I thought about doing that, but after a week of living with this pantry reorganization I found I don't need labels - everything is visible! Next Grocery related project to tackle: KITCHEN! What do you need to organize? Join our discussion on Facebook and Twitter! Friday Funny: Groundhog Day - Wait What? !